A ride through pristine countryside in northern Michigan, a beautiful July day, top down, with hot women as companions……lurid thoughts emerge as to how the day might unfold. However on this day, 190th of the year, ours turned to, what else, infrastructure systems for clean water, sanitary sewers, and storm water management. Ever wonder about those circular grates at the base of cityscape trees? On the shore overlooking the south arm of idyllic Lake Charlevoix, at the renowned foundry of the East Jordan Iron Works, three 190SLs convened to visit the largest manufacturer of manhole covers, anywhere. What follows is all PG, for any reader whose mind might wallow in the gutter. Where there is rain, molten iron reigns. Within the twenty four hour window, the three aging 55 y/o Mercedes-Benz roadsters driven by club elders, logged a combined, astounding 1,236 miles, to meet and tour the EJ museum. Corporate hostess, Erin Nickle, whose charm and feminine guile elevated fire hydrants, hydraulically operated sewer grates, and company mantra (durable products of high quality supported by unparalleled customer service) to a heartthrob level. And she has gorgeous blue eyes, not that I noticed. Treated as visiting royalty, we are afforded the opportunity to pose, along with a commemorative manhole cover, on the lawn of corporate headquarters. Combine the photo-op with a gourmet luncheon at the Charlevoix bridge, homemade ice cream in Petoskey, and a 56 mile escorted tour, by guides and fellow gearheads, Keith and Marie Ambs in their 1934 Plymouth coupe as the lead dog…well, it doesn’t get any better than this. The moral to the story: join up with old friends, and drive. Responding to the question; here’s some money, would you like to go shopping? Note that smiles had to be photoshopped on all four faces. The immoral: did I mention that Erin was quite attractive ? Community pride is manifested in many forms, e.g., Tulsa, OK (birthplace of Garth Brooks), Dyersville, IA (farm location of the movie, “Field of Dreams”), Tryon, NC (The Bulletin, smallest daily newspaper in the U.S.), the list becomes infinite. 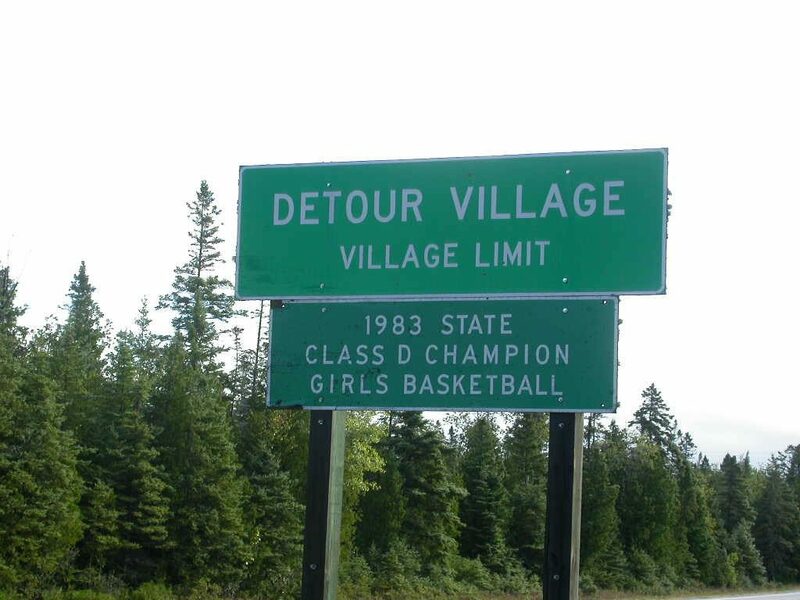 DeTour Village, an aptly named town at the eastern tip in the Upper Peninsula of Michigan, is so small it reflects 30 years in reverse to highlight its most recognized achievement. Reaching DeTour is simple. After crossing the Mackinac Bridge, turn east on state road M-134, uninterrupted, and ride the north coast of Lake Huron; the last, pristine, undeveloped shoreline on the entire Great Lakes basin. No McMansions, glitzy marinas, or requisite, garish vinyl clad condos. Locals refer to the highway simply by an adjective, the “Scenic”. 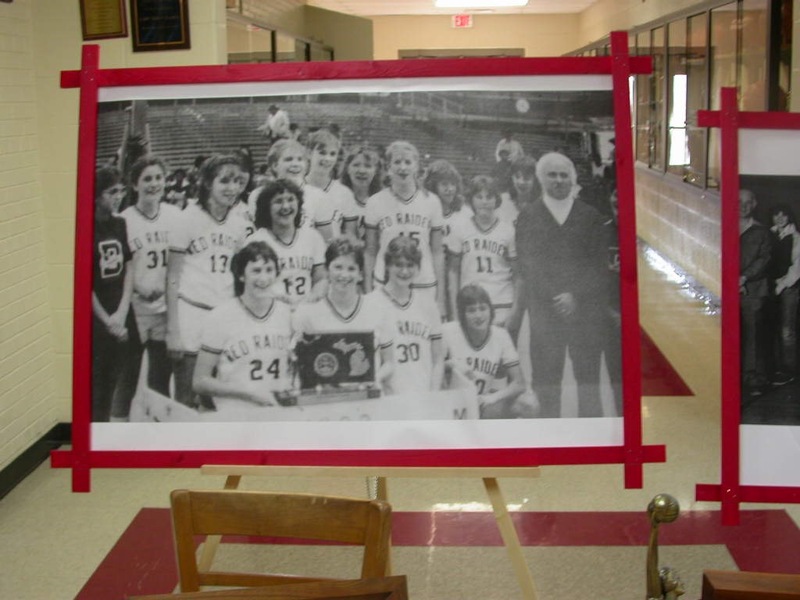 Located at the end of a forty mile cul-de-sac, a mere 3 miles across the St. Mary’s River to Saint Joseph Island, Canada and a claimed population of 420, it is home to the 1983 Girl’s High School basketball champions, the DeTour Red Raiders, with a record 26-0. 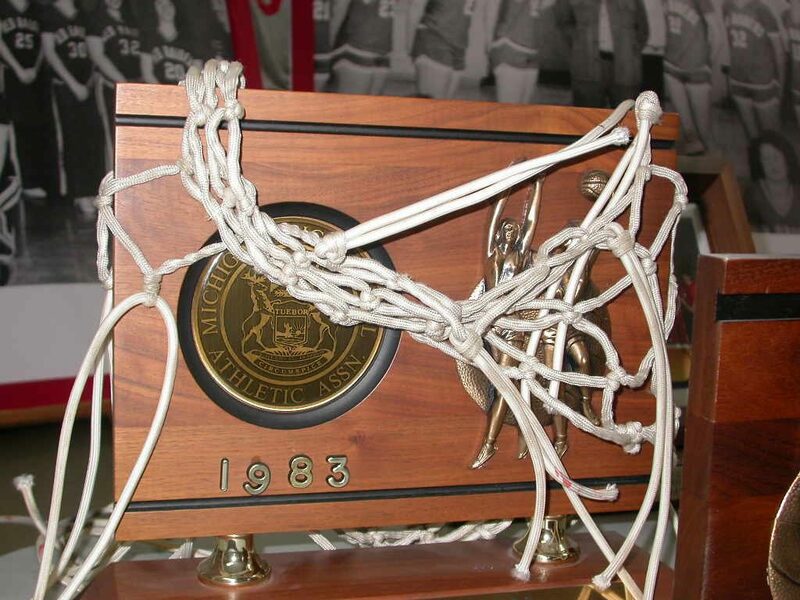 One year prior, the 1982 team, 26-1, lost only the state championship game. By a single basket. 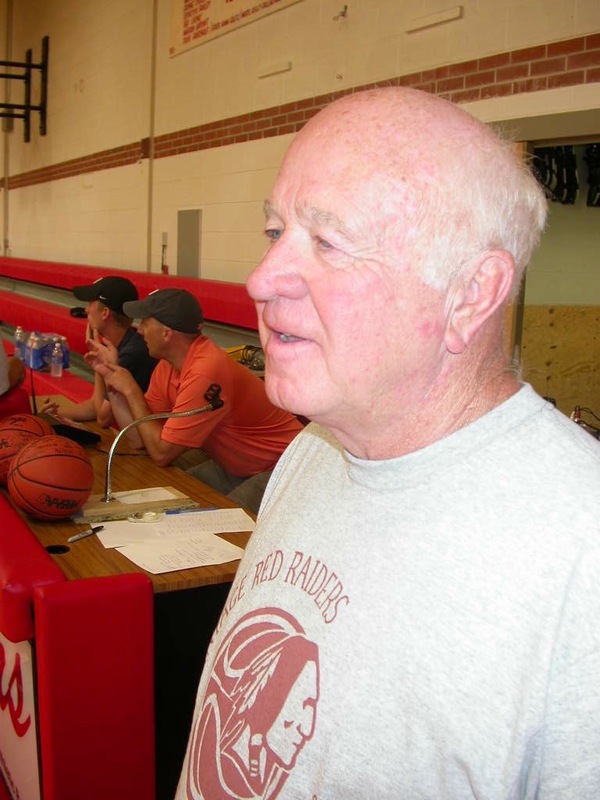 No fluke however, as the David F. Miller coached team, in five years from 1981-1985 amassed a record of 124-5. Those are John Wooden, Adolph Rupp, Red Auerbach numbers. Tonight, a reunion game to commemorate the victory, pitting the 1983 squad vs. the current 2013 team, has packed the gymnasium with more than 800 friends, neighbors, alumni, children, parents. The pre-tipoff tension is palpable. The 50/50 lottery pool totals a tidy $756. 19 players from the three decade past era have returned and practiced in advance. They are not quite as buff as their championship photo. All nearing 50 y/o, their enthusiasm and competitive spirit have been ameliorated by menopause, marriage, child-bearing, and a few divorces. One, a gorgeous, statuesque, and pony-tailed blond, has six children and four grandchildren. She could easily audition a Celebrex or Cialis commercial on network television. The game atmosphere is intense. Perspiration trumps inspiration, defense is tight, elbows flay, this is serious s##t. At the end of the 1st quarter, the elderly prevail, 4-2, but as the first half buzzer sounds, a nail biting 13-13 tie. The overflow crowd cheers every shot and roars at each score. Teen-aged boys cheer their mothers on and boo their female classmates. The battle of the sexes. Shooting percentages, also in the low teens, but no one is keeping statistics. What matters is that on this July Fourth weekend, small town America was the shining moment, a reunion night, a generational memory to savor for a lifetime. Briefly, time stands still, a time to be thankful we’re not in Kabul, Cairo, or Damascus, but in a high school gym adorned with a championship banner adjacent to the American flag. Long may they both wave. The Detour girls basketball team won. And I did not win the 50/50 drawing. Detour there’s a muddy road ahead, detour….